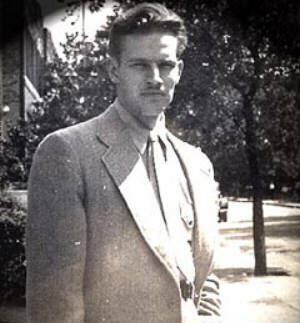 Charlton Heston, as a 19-year-old student at Northwestern University, Evanston, Illinois, in the 1940s. Heston won fame for epic roles including one as Ben Hur, shown here driving a chariot and team of horses. About 25 years ago famed actor Charlton Heston sent $100 as a donation to preserve a Bay City icon, the Princess Wenonah mosaic that had graced the floor of the Wenonah Hotel. The name Heston was vaulted back in the news recently when Jerry Nunn of The Bay City Times wrote that the state wants to purchase about 1,300 acres of Heston's family property near Lake St. Helen in Roscommon County. A letter from Heston to The Times in the late 1970s stated that he was making the donation tosave the mosaic because he had fond memories of visiting the Wenonah during family trips to Bay City as a boy. The mosaic was part of the lobby floor of the Wenonah. The classic mosaic of the Longfellow poem heroine, mother of Hiawatha, had tobe rescued from a farm field several years after the hotel was destroyed by fire Dec. 10, 1977. The Princess was preserved and was on display on the ground floor at City Hall for many years and has been donated to the Bay County Historical Museum. Heston spent his early years in St. Helen, Michigan, when he was known as John Charles Carter. He took the name Charlton from his mother, Lilla Charlton, and his stepfather, Chester Heston. In his early years Heston campaigned for Adlai Stevenson in 1956 and John F. Kennedy in 1960. In the 1980s he supported conservative and libertarian causes and campaigned for Ronald Reagan, George H.W. Bush and George W. Bush. Heston is well known and revered by many asa prominent conservative and former president of the National Rifle Association. A couple of Presidential elections ago bumper stickers sprang up saying: "My President is Charlton Heston," indicating his popularity for supporting the right to bear arms. His most dramatic statement came the 2000 and 2003 national conventions of the National Rifle Association when he raised an antique rifle above his head and said his rights would only be taken "from my cold, dead hands." In 2003 he received the Presidential Medal of Freedom, the nation's highest civilian award, from President George W. Bush at the White House. Although Heston is suffering from Alzheimer's much the same as his hero, Ronald Reagan, and has not appearedpublicly in some time, his public persona is still fondly recalled, ironically, as much by liberals as by conservatives. Heston volunteered in the Civil Rights movement in the 1960s and even marched alongside the Rev. Dr. Martin Luther King inseveral protest demonstrations, including the 1963 March on Washington. In the original uncut version of "King: A Filmed Record, Montgomery to Memphis," 1970, he appears as narrator. He saw no contradiction between his Civil Rights work in the1960s and advocacy of gun ownership rights in the 1990s, saying in both areas he was "promoting freedom in the truest sense." According to his autobiography, "In the Arena," he supported the freedom of speech and the First Amendment. He opposed McCarthyism, racial segregation and the Vietnam War and considered Richard Nixon a disaster for America. He contended that he was a Native American and decried protests against use of native nicknames in sports. He clashed with Chinese officials while directing a stage production in Bejing in 1988, insisting that his actors be paid a fair wage. He took the same stand with several American directors. Just seven years ago Heston gave one of the most memorable speeches ever written and presented by an actor. His peroration, "Winning the Cultural War," was given Feb. 16, 1999 at Harvard University Law School. "If Americans believed in political correctness, we'd still be King George's boys -- subjects bound to the British crown," he said. "Firearms are not the only issue," he said. "I've come to understand that a cultural war is raging across our land in which, with Orwellian fervor, certain accepted thoughts and speech are mandated."